It wasn't until I was overseas one year about this time that I realized just how special--and uniquely American--our Thanksgiving holiday is. Of course it was first celebrated by the Pilgrims about 400 years ago. However, it has also seen a revival of emphasis and solemnity during times of national struggles, unprecedented prosperity, wartime and in peace. Leaders have offered calls for genuine thanksgiving and devine guidance to our Lord throughout our history. (1) One of eight such proclamations by Ronald Reagan is given below. (2) We all wish you a happy and meaningful Thanksgiving. The celebration of Thanksgiving Day is one of our Nation’s most venerable and cherished traditions. Almost 200 years ago, the first President of these United States, George Washington, issued the first national Thanksgiving Day Proclamation under the Constitution and recommended to the American people that they be devoted to the service of that great and glorious Being, who is the beneficent Author of all the good that was, that is, or that will be. He called upon them to raise prayers and supplications to the Great Lord and Ruler of Nations, not merely for continued blessings on our own land but on all rulers and nations that they might know good government, peace, and concord. A century ago, President Grover Cleveland called for prayers and song of praise that would render to God the appreciation of the American people for His mercy and for the abundant harvests and rich rewards He had bestowed upon our Nation through the labor of its farmers, shopkeepers, and tradesmen. Both of these Proclamations included something else as well: a recognition of our shortcomings and transgressions and our dependence, in total and in every particular, on the forgiveness and forbearance of the Almighty. Today, cognizant of our American heritage of freedom and opportunity, we are again called to gratitude, thanksgiving, and contrition. Thanksgiving Day summons every American to pause in the midst of activity, however necessary and valuable, to give simple and humble thanks to God. 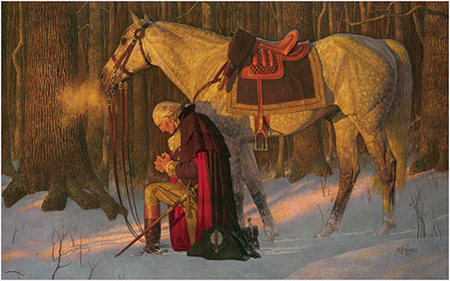 This gracious gratitude is the service of which Washington spoke. It is a service that opens our hearts to one another as members of a single family gathered around the bounteous table of God’s Creation. The images of the Thanksgiving celebrations at America’s earliest settlement - of Pilgrim and Iroquois Confederacy assembled in festive friendship - resonate with even greater power in our own day. People from every race, culture, and creed on the face of the Earth now inhabit this land. Their presence illuminates the basic yearning for freedom, peace, and prosperity that has always been the spirit of the New World.